Some pet owners have the amazing ability to establish such a strong communication with their dogs, that they do not even buy collars. When they have to take the dog along for walk, they just walk beside the dog. The dog aptly keeps pace and company. However, for most owners, getting a dog collar is a necessity. The dog does not mind unless you are making sure to not fastening the collar too tight around his neck. Always ensure that you have a space of two fingers between the dog’s neck and the collar. For furry dogs, you have to be extra careful. Ensure that the furs do not tangle with the collar. 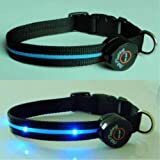 You can easily buy stylish dog collars from a reputed online store. Nowadays, you can get different types of fashion dog collars, making them a nice accessory for stylish pets. Obviously, as one’s pet is the part of the family, so if the owner likes style, she would definitely like to get a great dog collar. Besides, there are several practical applications of a dog collar. For starters, you can put up a name and address tag with the collar. This can be a lifesaver if you accidentally lose your dog. However, do not forget to mention at least two phone numbers in the tag. In that way, even if one number is not working, you can still get the call from the rescuer good Samaritan. 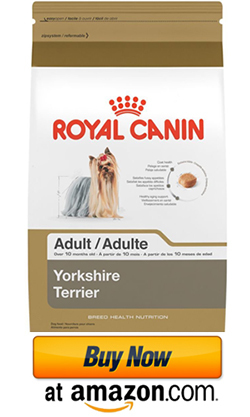 They provide custom personalization with your dog’s name. The various available colors are red, black, blue, light blue, pink, navy blue, purple, orange, lavender, yellow, hunter green, grass green, and light green. 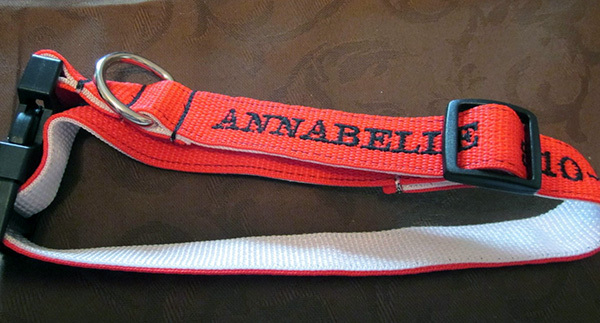 The company can embroider the dog’s name and your phone number in any color you want. Multicolor threads and glow-in-dark threads are also available. 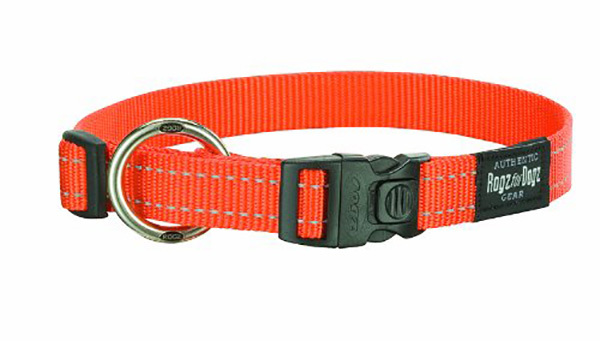 Dog collars are available in various sizes, so finding the right size is not a problem. Whether you have a small dog, or a bulky canine, you can find collars of any sizes. 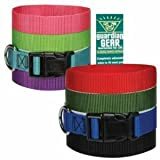 Most of the collars are adjustable, while some are available in general sizes. Find the online store that maintains a good collection of various collar sizes. Whether you want a small dog collar, or a big one, you must be able to get it easily. Many small dogs look great in colorful collars. This is the deep pink, you would love to gift to your dog. Although she may not understand the significance of a pink leopard print, yet seeing you so happy to gift the collar, your dog would be happy too. Make this another opportunity to strengthen the friendship between you. However, while buying these, always make sure that they have a comfortable texture. The dog must not feel irritated to wear the collar. If your dog does not like the collar, he would express his displeasure and discomfort. As a dog-owner, you can easily understand the problems with the collar. If it is a size issue, buy another color. If it is an adjustable collar, carefully select the right size. Watch out for the body language approval from your pet. Do not compromise on the comfort aspect. Dogs being such noble souls would bear the discomfort. However, you must take every effort to ensure that your pet feels happy wearing the collar. These are only available in medium size. 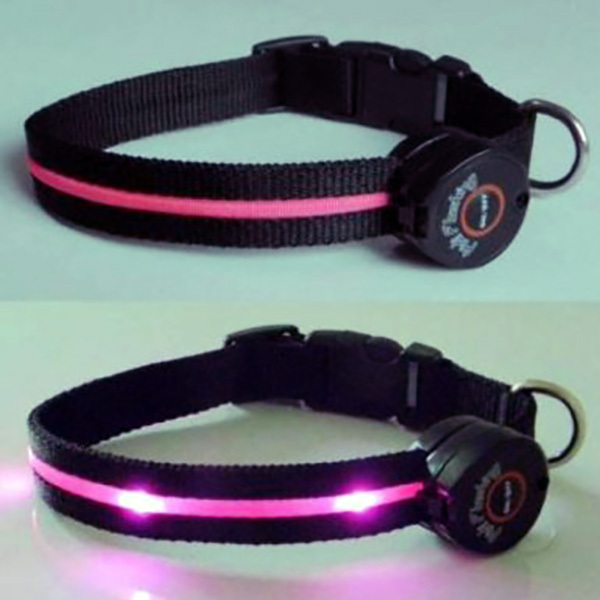 These are great to walk your dog in the dark. You can adjust the LED lights in any of the three settings, steady, low and quick flashing. Perhaps, the dog would also feel a new experience with constant light flashes coming from behind his eyes, and never leaving him. Many dog owners report that their dogs adjust well to the LED flashes. These fashion dog collars are especially useful for black dogs. These collars are available in various sizes. The ergonomic contoured design means the collar would snugly fit across. However, since there is a solid steel ring, you must be careful about setting the collar. Make sure that there is at least a gap of three fingers between the collar and the neck.